All Bishop McGann-Mercy Diocesan High School alumni are invited to join in an alumni softball game on Sunday, May 17, at 1 p.m. 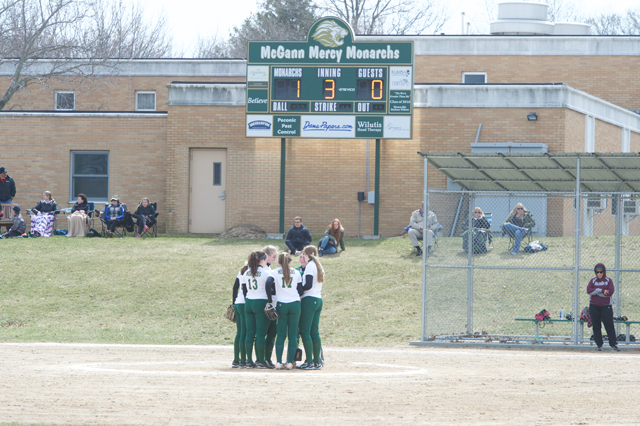 The game will be played on the McGann-Mercy softball field next to the junior high school. Anyone interested should RSVP to the McGann-Mercy alumni office at 631-727-5900, ext. 403. At several points during a nearly two-hour meeting last week between McGann-Mercy High School administrators and parents of football team members, principal Carl Semmler reiterated that his decisions put the best interests of the students first. GARRET MEADE PHOTO | Babylon’s Jack Kresek hits Bishop McGann-Mercy quarterback Mike Frosina while Frosina attempts a pass. The word on the street is that Babylon High School’s football team is even better than it was last year when the Panthers won the Long Island Class IV championship and the Rutgers Trophy, which is given to the most outstanding team in Suffolk County. A reporter who covers the team said the current squad is the strongest he has seen in 20 years. Now that has to send a chill through teams throughout Suffolk Division IV and beyond. It just may be. The Panthers have been beating opponent after opponent in dominant fashion. In other words, it has been business as usual in Babylon this season. 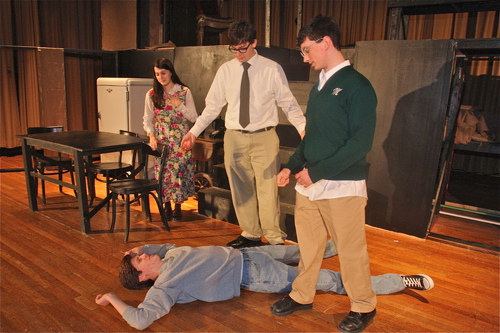 On Friday night it was Bishop McGann-Mercy’s turn to take its medicine. Babylon, playing its final regular-season at home, assured itself of a playoff game in the familiar surroundings of Coach Walt Williams Field with a 41-6 defeat of the Monarchs. Babylon (7-0), which started the day as one of only three unbeaten teams in Suffolk, extended its winning streak to 19 games. Impressive as ever, Babylon was once again a model of offensive efficiency and defensive toughness. Babylon surged to a 28-0 lead by halftime, by which time the Monarchs (0-7) had minus-7 yards of offense. McGann-Mercy finished the game with only one first down and 63 yards in offense. Meanwhile, Babylon scored touchdowns on five of its first six possessions. The Panthers have produced 29 touchdowns in 34 first-half possessions this season. That doesn’t include a strange play that brought the second score of Friday’s game. A line-drive punt by McGann-Mercy’s Andrew Glasgow was caught near the line of scrimmage by Babylon’s Luke Zappia, and he ran the ball back 30 yards for his fourth touchdown of the season late in the first quarter. Babylon put the ball in the air only five times, but three of them went for touchdowns. Nick Santorelli, one of the 16 Babylon seniors who were recognized and presented with a rose during a pregame ceremony, hit Stony Brook University-bound Jake Carlock for a pair of touchdowns. The two slants, of 25 and 32 yards, were Carlock’s only catches of the night before Babylon coach Rick Punzone started making multiple substitutions in the second quarter. But the second catch gave Carlock, a senior, his 15th touchdown of the season, a school record. Santorelli was replaced at quarterback by Henry Brunjes about midway through the second quarter, and Brunjes immediately led a drive that ended with him finding an open Eddie Vega in the end zone for an 11-yard reception. It was the first touchdown of the year for both of them. Making it look easy, Babylon continued putting points on the scoreboard in the second half. Stephen Schweitzer scored on a 7-yard run and Brunjes ran one in from 5 yards out himself. The Monarchs averted a shutout when their quarterback, Mike Frosina, turned what coach Jeff Doroski said was a busted play into a touchdown. It looked like a naked bootleg, with Frosina faking a handoff before darting around the left side and racing 30 yards to the end zone. It was McGann-Mercy’s only third-down conversion of the game. Eleven Babylon ball carriers contributed to the team’s 207 rushing yards. Pat Marelli made a game-high 7 tackles for the Monarchs; all of them were solo except for one, and two were for losses. FILE PHOTO | Riders from last year’s Bike for Life during a quick break in Rocky Point. A priest, two teachers and a group of students pedal bikes down the road … No, this isn’t the start of an potentially offensive joke. Instead, this is exactly the sight to be seen across the North Fork this weekend on Main Road or Sound Avenue. The 27th annual McGann-Mercy Bike for Life, in which students from the private high school cycle from Port Jefferson to Orient Point, will take place over four days beginning Thursday morning. This year, the riders include 15 current students and alumni, two teachers, three support staff, and of course, the school’s chaplain, Rev. Gerald Cestare. The trip across the North Fork is about more than exercise. The Bike for Life also incorporates a spiritual aspect for the Catholic school students. Each day of pedaling ends at a local church where students engage in activities and talks, giving the weekend more of a retreat feel. The discussions revolve around teaching students about living a wholesome life as they grow older, building up their school community, dealing with the pressures and worries of high school, cherishing their faith and sexuality. Riders kick off the trip in Port Jefferson and will travel along 25A and Route 48 until they reach St. Patrick’s Church in Southold, where they will spend the night. On Friday they will continue to Orient Point Beach Park, where they will have a beach barbecue and then circle back to St. Agnes in Greenport for the night. On Saturday they will ride to Sacred Heart Church in Cutchogue, and then on Sunday they will travel back from Sacred Heart to Port Jefferson for a closing Mass at Infant Jesus Church. The event is sponsored by McGann-Mercy Campus Ministry.